In his latest column, Ceasefire associate editor Adam Elliott-Cooper looks at Black nationalism, an intrinsic aspect of the anti-imperialist struggle. Many contemporary social movements across the Global South, he argues, are problematising the nationalism of the past, and finding new focal points and organising methods to resist modern-day imperialism. If information got into the wrong hands it could cause problems for the movement… People had full confidence in the leadership. They believed that even if they did not have all the information, the leaders who did had the best intentions”. The ideology of the ANC, although diverse, carried a consistently elite vanguardist thread – Govan Mbeki’s prison writings present a guide as to how a political movement involved dividing communities into subsections, so that even “the task of organising the migrants in the hostels must necessarily fall upon the ANC” . 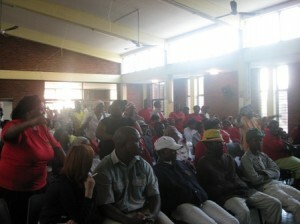 To attain these and other goals, the ANC developed joint co-ordinating committees and planning councils to plan campaigns and actions, selecting certain members of communities to become involved whilst “hundreds and thousands of potential resisters were turned away by Congress officials” according to the firsthand account of longstanding trade union leader Naboth Mokgatle. The ANC thus constructed a rigid bureaucratic hierarchy whilst operating as a liberation movement. However, many found it difficult to adjust to the requirements of accountability and electoral input which were absent when the ANC was under ground. Trevor Ngwane notes that when apartheid fell: “The returning ANC leadership started by closing down the other structures, in the name of unity: ‘Why do you need your own Youth Congress? We have the Youth League’; ‘Why do you need the Transvaal Federation of Women?”. Internal democracy and accountability have also been lacking in the post-apartheid ANC government. Multiple government departments were consolidated into a small number of committees, all co-ordinated and controlled from the president’s office. The ideology of hierarchy and centralised power has been most damaging however, economically. In 2007, South Africa created 5,073 new dollar millionaires, many of whom have strong links with the ANC and the policy of privatisation and deregulation – the source of their vast wealth. But at the same time unemployment reached 48% and twenty-two million South Africans now live in abject poverty, with 4 million living on less than $1 a day according to analysts such as William Gumede and Naomi Klein. In response, those betrayed by the promises of the ANC have built an alliance which challenges not only economic inequality, but the ideology of hierarchical power relations. These organisations work under the umbrella of the Poor People’s Alliance, who have developed the race politics of Black Nationalism to incorporate all power relations, such as gender and class. They have been inspired by resisters to imperialism in Mexico, such as the Zapatistas and those in Brazil like MST. They have gone to great lengths to ensure that their organisations do not construct hierarchies which can lead to the huge democratic deficits displayed in the ANC. 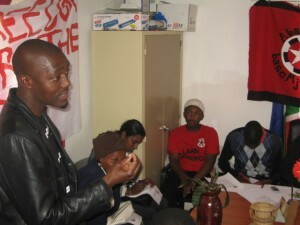 Zikode of Abahlali baseMjondolo (AbM) explains that “some NGOs and some academics still believe that social change cannot come from the bottom and still believe that democracy is all about being loyal to their authority …it is an insult to assume that poor people cannot think for themselves, that someone else must talk for them without their concern”. The principle that all individuals in an organisation or collective should have equal input and agency is central to these groups. For AbM, this takes place at weekly meetings in which issues are discussed, and outsiders can propose building links with the movement if they are willing to “negotiate this with the movement’s democratic structures – all of which are always open to all”. AbM state their commitment to regular and direct accountability to those “elected, mandated and rotated whom at least half of the people elected to fulfil these responsibilities are women” . They go on to maintain that “[p]eople elected into office are not elected to make decisions on particular issues but rather to ensure a democratic decision making process”. Raj Patel notes that representatives at meetings “arrive with a mandate and return with a detailed report” and “[f]rom the very outset, leadership has been from the base”. 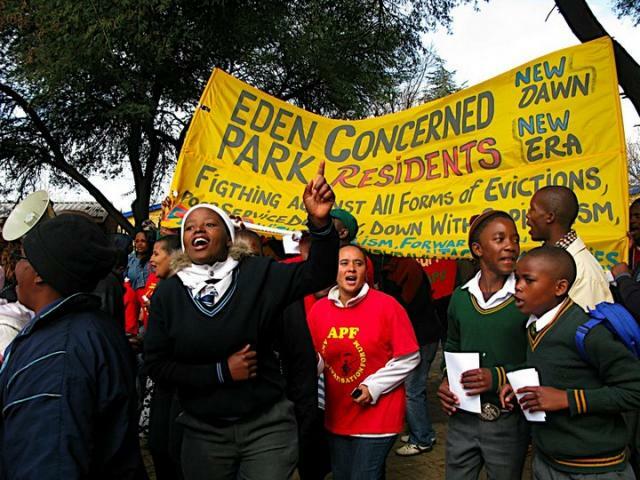 The autonomous groups in the Poor People’s Alliance are represented by 10,000s of poor South Africans, employing many of the tactics of the ANC during apartheid – utilising the courts, international solidarity and direct action to great effect. But their internal structures are horizontal and directly democratic, problematising all power relations. It is this progress which enables them to work towards a South Africa which represents all those who have fought to make it a genuine symbol of Black liberation in the 20th Century and beyond. Our brothers and sisters in South Africa can teach us a lot about how Black nationalism can lead us astray in our fight against imperialism, but more importantly, their current work teaches us how the analytical tools which problemitise power structures can create a sophisticated and encompassing approach to resistance to oppression in all its forms.